April 17th is National Cheese Ball Day. Here’s a classic recipe to whip up and serve with wine or cocktails. The cheese ball serves 5-8 people. The recipe is from Taylor Takes a Taste for EatWisconsinCheese.com. 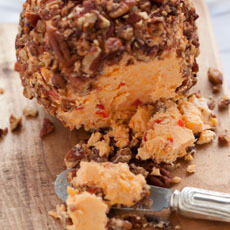 Pimento cheese ball with pecans. Photo courtesy Wisconsin Milk Marketing Board. 1. MELT the butter in a non-stick skillet. Add the pecans and toast until fragrant, but not burned. Remove from the heat and toss in the salt. Allow to cool, then chop into medium to small pieces. Set aside. 2. PLACE the remaining ingredients into a large bowl. With a fork, mix until creamy. Chill for 1 hour. 3. LAY about 12 inches of plastic wrap on a level surface. Scoop out the chilled pimento cheese and form into a ball on top of plastic wrap. Roll the cheese ball in the chopped pecans, making sure the entire surface of ball is covered. 4. WRAP the ball tightly in plastic wrap and freeze. Before serving, allow the frozen ball to thaw for half an hour. Serve with your favorite crackers, chips or pretzels.